"This is a modification of my father's hoppin' john recipe. The only difference between his and mine is the use of tomatoes. It's a great recipe for the holidays (New Year's) or any time during winter months. There are many versions of this recipe here, but this one is quick so you can throw it together after a long day at work for the whole family to enjoy!" Crumble sausage into a skillet over medium heat and cook until evenly brown. 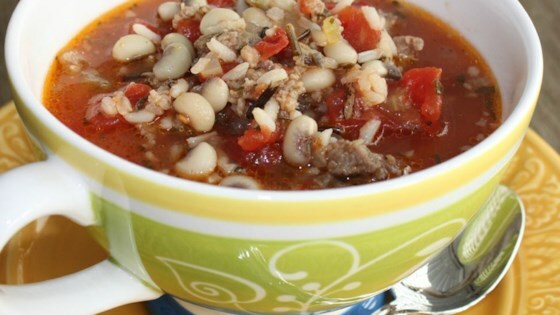 In a large pot, mix the cooked sausage, rice mix with seasoning packet, black-eyed peas, tomatoes, broth and water. Bring to a boil. Reduce heat to low, cover and simmer 20 minutes, or until rice is tender. Season to taste with salt. Made it by the recipe. Didn't care for it but my friend born and bred in Texas loved it. Go figure. I cut this recipe in half and it still fed 5 people for dinner - with leftovers for 2 the next day! I let it boil down to a very thick stew. Very Enjoyable!